”Reddish amber colour; toasted malt and hoppy aromas; smooth, creamy flavours with a pleasant bitter finish”. Today is Super Bowl Sunday and a great day to break in Kevin's new 60" plasma TV! Kevin lives about a half an hour's drive away and I can't get there by public transit. As I have to drive, I thought it would be a great opportunity to try a new light beer. Not a big North American brewery light beer, like Coors Lite or Bud Lite, but something that had a chance at providing some flavour. The search is on this year for a good tasting 4% or less light beer ... something with flav our. After searching around my local LCBO, I found one that provided hop, Tetley Light English Ale, which weighs in at 3.6% ABV. I love English ales and bitters. English breweries have been brewing lower alcohol ales and bitters for dozens of years. The idea is that patrons could stay longer without getting hammered and, therefore, be able to drink more pints at their pubs. Tetley's has been around since 1822, brewing their ales from a brewery in Leeds. In 1992, Carlsberg bought in a 50% interest and then bought out the brewery entirely in 1998 and created Carlsberg-Tetley. 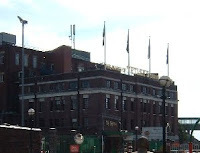 In 2004, the Tetley named was dropped and the company became Carlsberg UK. News came out that the Tetley brewery, which has been brewing beer from the same site since the opening, will be closed in 2011 and moved to Northampton. One interesting bit of trivia is that in 1911 the brewery challenged Harry Houdini to come to Leeds to escape from a padlocked metal cask of ale. Houdini, who had been performing milk can escapes in his show since 1908, accepted the challenge and made the attempt but in the end had to be rescued from the cask. Tetley is known more for its original bitter, which I will try one day, but today I was searching for good taste in a light beer. So ... what about the taste? This week ,instead of presently only my opinion of this ale, I brought extra so a panel of Kevin, Craig, Alfred and Stephan to taste and provide their insight. The beer pours with a storm surge, lasting about a minute which creates a rich creamy head which lasts. It was a much darker beer than I expected. It's easy to equate light colours with light beers. Nice lacings were left behind on the glass when I sipped it. I found it had pleasant hoppiness bite to it. The taste is not overpowering, a little light, with a surprisingly longer hoppy finish than I expected. Stephan found it extremely light, easy to drink but far too light in taste. Kevin did not like it, suggesting that it tasted like "someone pissed a Guinness". Kevin never asked me for a second one. Alfred liked it and found it "kinda hoppy ... not bad ... kinda like it." In the end, he defended the taste against Kevin's rants. Craig, despite my prodding, never did sample this but hell, he's a friend so I included him in the shot anyways. One more for me in my fridge. In the end, this is a beer which I would buy again ... Kevin doesn't get any!